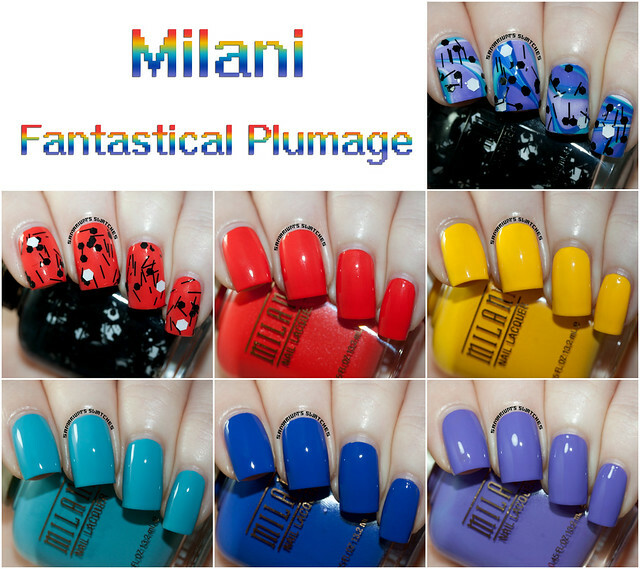 Milani Fantastical Plumage - Swatches & Review! Hey guys! Before I get into today's post you should go check out the guest blog post I did over at Refined & Polished!! And as for today, I have the Milani Fantastical Plumage Collection to show you all! Scarlet Ibis - Three coats. Blue Jay - Two coats. Purple Martin - Two coats. 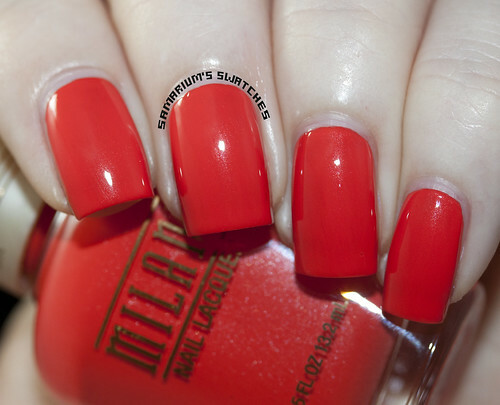 Carnival - One coat with dabbing/placing over Scarlet Ibis. Carnival - One coat with dabbing/placing over a Blue Jay, Peacock & Purple Martin watermarble. As you can see I tried a watermarble for the first time in over a year! I used a white base (Milani White on the Spot) and Blue Jay, Peacock and Purple Martin! The bubbling was fromt he topcoat and I think also from placing the glitters. Overall I think this is a very fun collection with great colors! Blue Jay is my favorite because I'm a sucker for blues! Purple Martin and Blue Jay had the best formula's but all the cremes are pretty and applied pretty good. Some were a little streaky and I felt they required three coats, mostly Canary and that is common in yellows. I recommend Sprinkles from the Milani Retro Glam Collection instead! And at select CVS and Meijer during August! 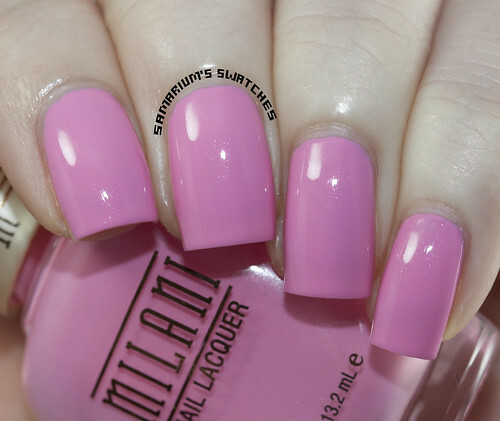 Follow Milani on Facebook, Twitter and Instagram! What are your thoughts on this collection? Are you going to pick it up? Hey guys! It's that time of year again - piCture pOlish Blogfest!! and my very first video tutorial attempt These are the three shades I used! Heavy Metal - Two coats. Honey Dew - Three thin coats. Hot Lips - Three very thin coats over White. Here is my tutorial, my very first one so yeah it's super far from perfect! There is also a pictorial thing below int his post! Here is everything I used! Start with nail strengthener and base coat. I used Nailtek II and Orly Bonder. Then apply your base colors. I used Honey Dew on my ring & thumb nails. I applied a white base to my pointer, Hot Lips on my middle nail, and Heavy Metal on my pinky nail. Frame your pinky nail using Hot Lips and a small nail art brush. Draw a X shape on your ring nail using Hot Lips, then fill in the sides. Draw a triangle on your middle nail using Honey Dew. Reapply Hot Lips to your "framed" pinky nail and the sides of the X on your ring nail for opacity. Using a small nail art brush and Heavy Metal, fill in the triangle areas on your middle & ring nails. Apply Honey Dew and Hot Lips to a wedge makeup sponge and apply to your white pointer nail. Repeat this process 3-5 times until your desired look is acquired! pick up the studs one at a time and apply to your pinky and ring finger nails. I used a 2mm circle neon pink stud on my pinky nail and a 2mm black square stud on my ring nail. onto your thumb nail. Once dry apply topcoat to all of your nails and you are good to go! Make sure to follow piCture pOlish! 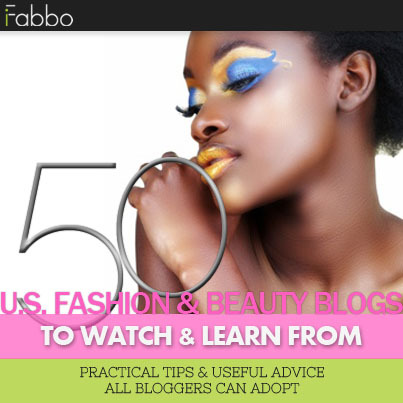 See other Bloggers Blogfest mani's on the Pinterest board here! 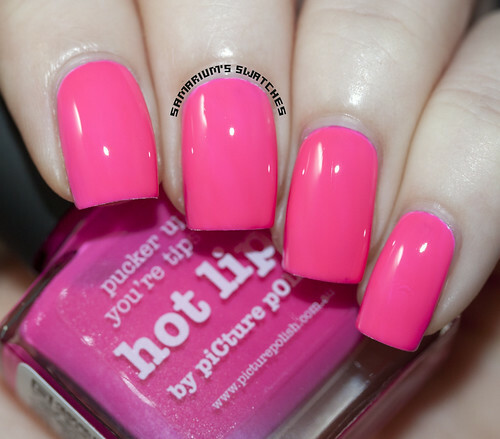 You can follow piCture pOlish via Facebook, Twitter, Pinterest, YouTube & Instagram! Milani Retro Glam Collection - Swatches & Review! Hey guys! 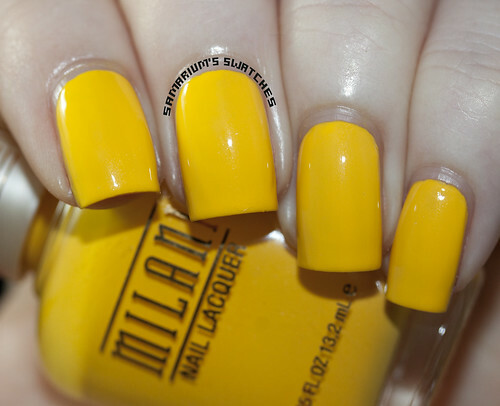 Today's post is featuring six new Limited Edition Milani Nail Lacquers! This is a really cute collection, it makes me think of spring! Gradient done with Almond Kiss, Strawberry Shake, and Raspberry Delight. Then I topped the gradient with one coat of Sprinkles. Strawberry Shake - Three coats. Raspberry Delight - Three coats. Raspberry Delight topped with one coat of Sprinkles. Creamy Pistachio - Three coats. Mint Chip - Three coats. Gradient with Creamy Pistachio & Mint Chip topped with Sprinkles. Almond Kiss - Three coats. Okay so this collection is really pretty and I love the colors they chose for it! They make me want to do flower nail art with em! All of them except for Sprinkles required three coats for me. The formula's on Mint Chip and Raspberry Delight were the best of the cremes! The other creams did go on pretty streaky, nothing that a third coat can't level out though. I think it's definitely worth mentioning because some people can't apply nail polish very evenly. Streaky polishes can exacerbate uneven application. Sprinkles is so great! 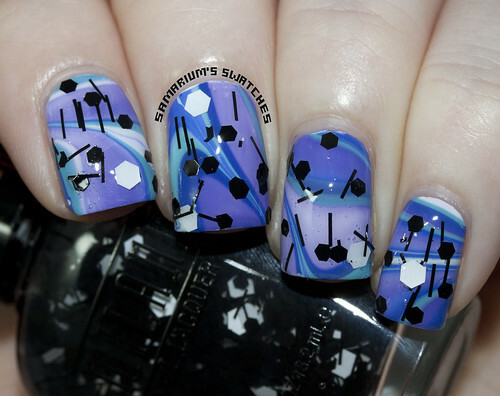 Even though I own quite a few B&W glitter polishes I just love this! It applies great and looks good over any and all colors! I won't have a lot of time to post this week but I made time to do this for Talia! For those who do not know who she is her YouTube channel is here. To be honest I didn't hear about her until a while ago but she was a really strong, talented and inspirational person. For this mani I used Sally Hansen Mint Sorbet, and some neon studs I bought recently from Born Pretty. Mint Sorbet was a bit streaky at first but leveled out nice at three coats. I will try to catch up but I'm not sure I will have time to even finish this challenge since my nephews will be here soon and I'm going to be watching them while my sister is at Comic Con, but I will try! 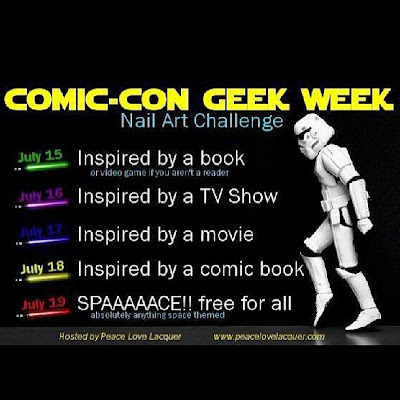 Gives me a chance to do nail art that I already plan to do anyway! For day one I decided to do a game mani, since I don't read very often anymore. 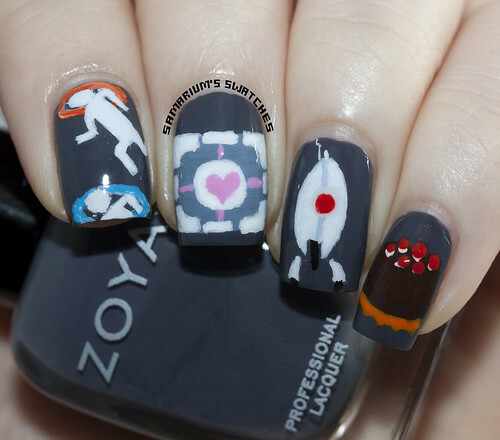 It was hard to decide between WoW, Bioshock and Portal! 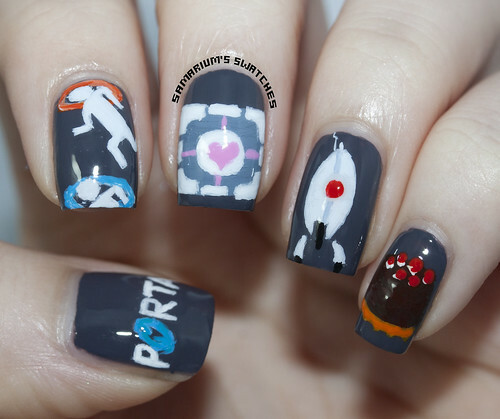 I chose Portal, seemed easiest and I was tired! So I didn't do the greatest job, I was sleepy. The pink used was China Glaze Dance Baby and the grey is Zoya Kelly. The rest is acrylic paint. Contrary Polish Color Context Trio - Swatches & Review! Hey guys! 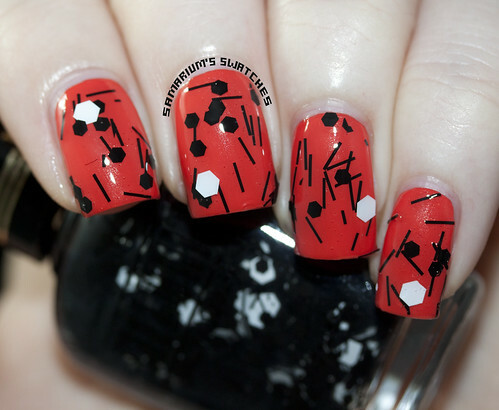 Today's post is the new Collection/Trio from Contrary Polish!! 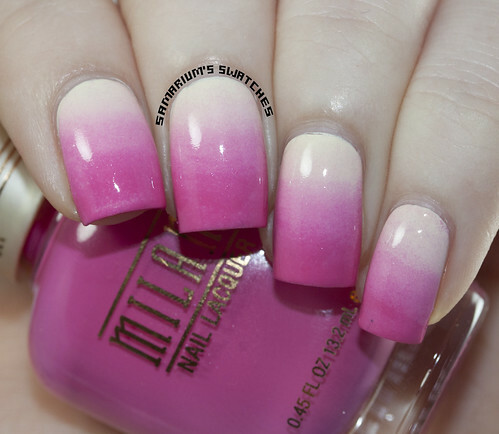 I'm loving these rich colors, I know summer is mostly about brights but I miss the deep shades! And be sure to go check out her anniversary polish Gift Wrap! Blood Orange - Three thin coats. "Red base with gold shimmer; overall polish has an orange tint"
Blood Orange is a gorgeous rich jelly-ish red that I think will look great on all skin tones. The gold shimmer makes the polish appear to have a orange sheen. Greenhouse - Three thin coats. "Blue base with gold shimmer; overall polish looks green"
Greenhouse is super interesting! It's a blue teal-ish base with tons of green shimmer. It has so much shimmer that it basically looks green! Indigo Rose - Three thin coats. and gives overall polish a purple tint"
The red-orange shimmer makes Indigo Rose appear purple instead of the blue base color, it's really neat! All three of these polishes are crazy gorgeous, even more so in person! My flash on camera made them look a bit sheer whereas in person it didn't look sheer whatsoever. Indigo Rose is probably my favorite, it's so unique! But Greenhouse and Blood Orange are killer too! I wore greenhouse for four days and then took it off today to swatch but I had zero chips and very minor tip wear! Contrary Polish makes the best shimmers, if you haven't checked out her polishes than you definitely should! Especially for those who want to try indies but dislike glitter bombs! All of the Contrary Polishes I have tried have all had impeccable formula's and these were no exception! They apply very evenly and smoothly, they aren't too funny so you don't have to worry about flooding your cuticles but they aren't too thick either. Seriously top notch formulas! You can also order mini's directly from her through her blog. 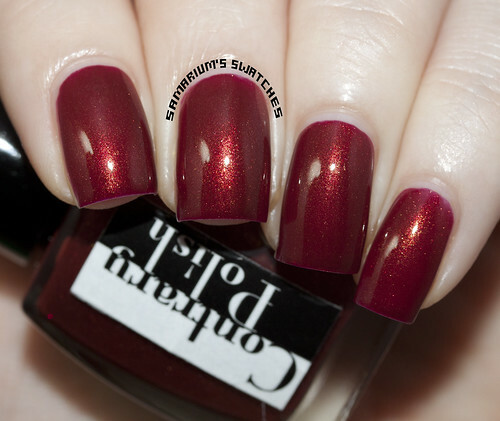 Follow Contrary Polish on Facebook and Twitter! What do you guy think of this collection? Have you tried Contrary Polish? Hey guys, today's post is Part Two with four more stunning polishes from KBShimmer! Iris My Case - Three coats. Iris My Case applied great, the glitters disperse perfectly and the formula was smooth. "Iris, Lilacs, Violets are some of of the most beloved flowers come spring, this pastel violet colored polish was inspired by all three. The soft purple base is filled with glitters in pink, purple, white, periwinkle and blue. 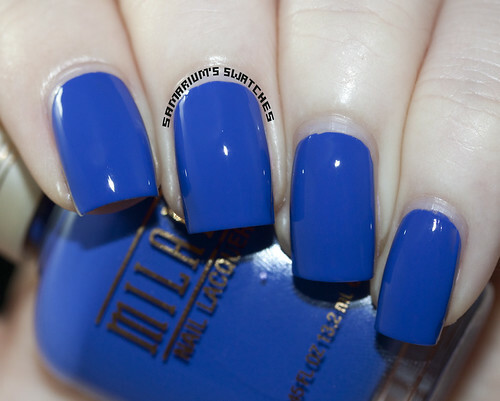 If you are not a fan of large glitters, this polish is for you." No Whine Left - Three coats. Gorgeous, the blue glitters in No Whine Left really pop in the plum base! Application was easy, a little streaky on the first coat but it evened out perfectly. "A deep plum, almost burgundy wine color, this polish is loaded with blue, aqua, fuchsia, and purple hex glitters in several sizes. The glitters in this polish seem to pop out in different lights, adding a fun depth to it. This polish is more of a “crelly”, a cream with jelly properties." Toucan Touch This - Three coats. I really love the mini bar glitters in this! Plus the color! The glitters will pull if you don't let it dry in between coats but it applies very evenly. 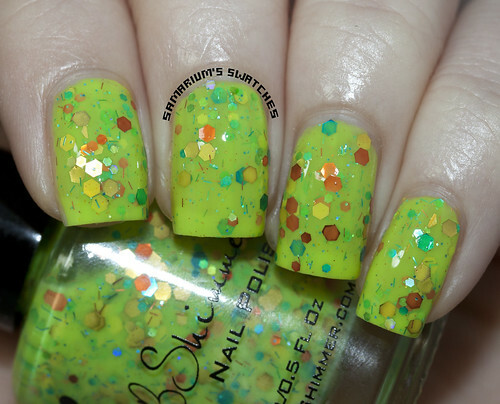 "A chartreuse base, almost lime green in color starts this bold polish out. Gold, green, teal, blue, and orange hex glitters, some holographic and a fun punch. Micro teal, orange and blue bars are accented by micro orange glitters. The bar glitter is micro fine, and adds a sparkle to the polish without the troubles of normal bar glitter." I felt like it needed the fourth coat but I apply coats very thin. The formula on this applied super evenly and just so easy. I love this one so much!! "After midnight, a full moon is lighting the night sky making it almost purple in color. Stars in different sizes sparkle and shine, like diamonds. This polish, with its deep grape color is full of holographic glitters made to mimic those diamond like stars." hands down in my top ten favorite indies for the creativity and formulation. I don't remember ever having to dab or place glitters with any of them, they just go on great! My favorite of these for is Witch Way! Even being a little sheer it just has so much depth and is stunning. You can purchase KBShimmer polishes from https://www.kbshimmer.com/ for $8.75 ea. Along with many other nail, cuticle and body products! You can also purchase KBShimmer polishes from Etsy and Harlow & Co.
To stay up to date with KBShimmer follow via Facebook, Instagram & Twitter! What do you guys think of these? Do you own any? What is your favorite KBShimmer or biggest KBShimmer lemming? The giveaway winners have been chosen! !